There’s a little story behind this article (which unaccountably appeared without a byline, although I did receive a credit for the reviews of Satan’s Slave and Terror published in the same issue). 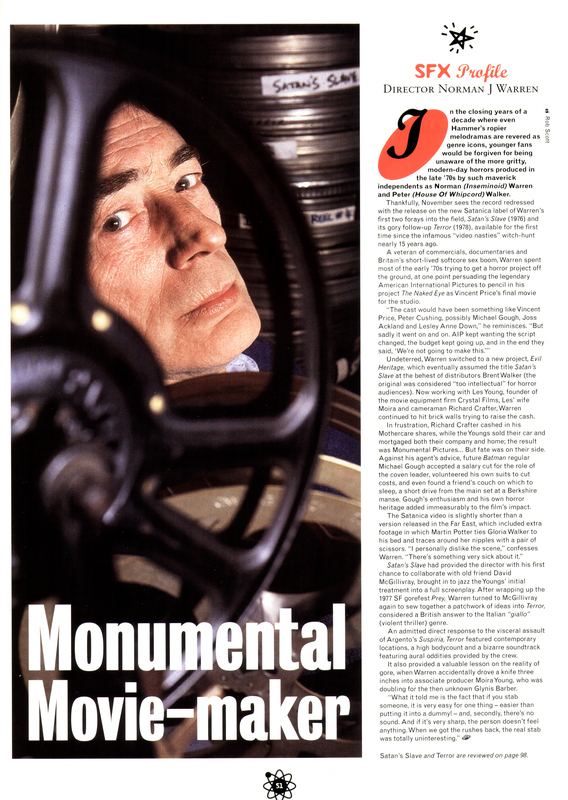 I’d interviewed Norman at the 1997 Festival of Fantastic Films, but during the closing ceremony, whilst I was on stage with John Landis, some unknown scumbag sneaked into the main hall and stole the bag containing both my camera (with irreplaceable photos of myself with my new god-daughter, Heloise) and my tape recorder. Fortunately, Norman was agreeable to recreating our conversation via telephone, and my late wife Ann generously offered to transcribe the result. Bringing the story forward to the present day, Norman is actually working on a new movie and has agreed to discuss this project on a forthcoming edition of Ghostwords TV. A shortened version of this interview had appeared in Fantazia, a monthly magazine published by Birmingham-based Pegasus Press and which was later rebooted as the short-lived Academy. For a more recent chat with Ramsey, check out the first episode of Ghostwords TV. The inaugural episode of Ghostwords TV is now available online, featuring an interview with Ramsey Campbell, news and reviews, editorial opinion and a personal tribute to David Bowie. You can subscribe to the feed here.